Please see the previous article at http://ponnadi.blogspot.in/2014/05/virodhi-pariharangal-23.html. thIrtham means pure/sanctified/holy water. The purity is acquired by coming in contact with bhagavAn, AchAryan, etc. Water that is used in emperumAn's thiruvArAdhanam is known as thIrththam. It is also said as "perumAL thIrtham". Bathing emperumAn is known as "thirumanjanam" in srIvaishNava paribhAshai (language). Others call emperumAn's bathing as "abhishEkam". The water that was used in bathing emperumAn is called "thirumanjana thIrtham". It is collected and is distributed to everyone in the srIvaishNava gOshti (and others too). 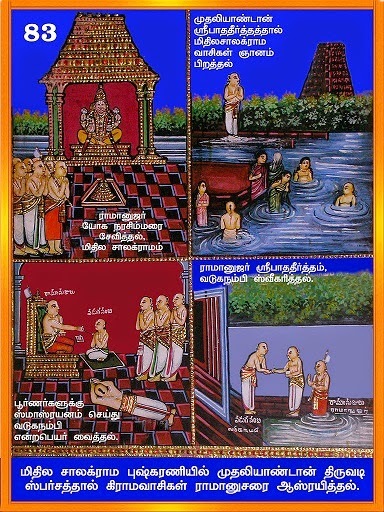 Also srIvaishNava's bathing is identified as "thIrthamAduthal" in srIvaishNava paribhAshai. Also, the charaNAmrutham (water that is used to wash the lotus feet) of AchAryas and highly qualified srIvaishNavas is called srIpAdha thIrtham. The water that comes into contact with the pAdhukas (sandals) of AchArya is also called srIpAdha thIrtham. In this section "thIrtha virOdhi", we learn about the norms, practices, etc., related to perumAL thIrtham, thirumanjana thIrtham and srIpAdha thIrtham. Translator's note: thIrtha has many meanings - venerable/sacred, holy water, holy place, bhagavAn himself (who is purest and will purify whoever associates with him), etc. Here the focus is on holy water that are of various kinds as explained before. Let us see them in detail. Accepting perumAL thIrtham at/from prayOjanAnthara parars' (ones who are focussed on material favours from emperumAn) residences is an obstacle. mumukshus are the ones who are focussed on mOksham (eternal kainkaryam to emperumAn in paramapadham). Ones who are focussed on other materialistic benefits are generally called bubukshus (desirous for material enjoyment). Accepting perumAL thIrtham from such persons are detrimental as any contact with such persons will influence us too and may disturb our steady faith in the pUrvAchAryas' words. Accepting perumAL thIrtham in front of sAdhanAnthara parars (one who consider anything other than bhagavAn as the upAyam/means) is an obstacle. Translator's note: sAdhanam means upAyam (process) to accomplish something (here we are focussed on eternal kainkaryam to emperumAn). There are many processes that are explained in sAsthram as upAyam to achieve eternal kainkaryam to emperumAn namely karma yOgam, gyAna yOgam, bhakthi yOgam, etc. Even prapathi is considered as upAyam by some persons. But true prapannas/saraNAgathas consider only bhagavAn as upAyam (benedictor of eternal kainkaryam to us). Such persons should not consume anything in front of others who consider ones own self-effort as the means to achieve emperumAn. Accepting perumAL thIrtham in front of manthrAnthara parars (one who engage in reciting manthrams other than dhvaya mahA manthram) is an obstacle. rahasya thrayam (thirumanthram, dhvayam, charama slOkam) are instructed to sishya by AchArya and any other manthrams are highlighted here - these may also include manthrams related to dhEvathAntharams (other dhEvathas than srIman nArAyaNan). Translator's note: dhvaya mahA manthram is glorified greatly by our pUrvAchAryas due to the clear revelation of bhagavAn being upAyam (process/means) and pure kainkaryam to thAyAr and perumAL being upEyam (goal). Of all the manthrams, this manthram is glorified as manthra rathnam and our pUrvAchAryas always recommended that we constantly recite/remember this manthram. In pUrva dhinacharyA, eRumbi appA identifies that mAmunigaL's lips are constantly reciting dhvaya mahA manthram and his mind is always meditating on its meanings (thiruvAimozhi and its vyAkyAnams). Verifying the sanctity of perumAL thIrtham before consuming the same in dhivya dhEsams is an obstacle. That is, in dhivya dhEsams (sannidhis/temples) one should not hesitate to accept thIrtham. dhivya dhEsam means those temples which are glorified by AzhwArs in dhivya prabhandhams. The same rule also applies for any temple that are connected to AzhwArs/AchAryas (example: abhimAna sthalams, their avathAra sthalams, etc) - they are as good as dhivya dhEsams. Not verifiying the sanctity of perumAL thIrtham before consuming the same in other places is an obstacle. Translator's note: Beyond dhivya dhEsams, abhimAna sthalams and AzhwArs/AchAryas avathAra sthalams - we have to ensure that there is proper srIvaishNava kramam being followed, etc. For example, our elders usually ensure that there is presence of AzhwArs/AchAryas sannidhis in the temple and proper worship is conducted for them along with emperumAn before visiting a temple. Accepting thIrtham amidst samsAris (materially focussed persons) is an obstacle. We have already discussed who samsAris are. Translator's note: Our pUrvAchAryas have totally avoided mixing with people of such mentality and consuming anything in front of them. Accepting thIrtham before other srIvaishNavas is an obstacle. We should wait for other srIvaishNavas to accept thIrtham first and then accept. We should not try to forcefully/intentionally go ahead of others to get thIrtham before them. Hesitating to accept thIrtham when we are in a particular direction/situation is an obstacle. There are no specific rules to accept thIrtham like we should be facing east, etc. Wherever we are in the srIvaishNava gOshti, we can accept thIrtham right there. After accepting thIrtham one should apply the same on the ones own eyes and head with reverence - not doing so is an obstacle. Looking to wash ones hands after accepting thIrtham is an obstacle. Not washing ones hands before engaging in another kainkaryam for bhagavAn, AchArya, etc. While consuming thIrtham, ones hands may have contacted their lips - to purify such contamination (of touching lips), one should wash their hands before moving on to next kainkaryam. Spilling thIrtham in the ground is an obstacle. One should carefully keep their upper cloth underneath their right hand while accepting thIrtham and ensure that there is no spilling. Translator's note: It is explained in sAsthram that whoever spills thIrtham is committing great sin. Same thing is said about stepping over thIrtham or prasAdham. Sprinkling the thIrtham on the head like people who lack sampradhAyam knowledge is an obstacle. Translator's note: As mentioned before, thIrtham should be gently applied in the head and eyes. It should not be casually sprinkled like layman. Accepting thIrtham with discussing useless matters is an obstacle. thIrtham should be accepted with great reverence and we should avoid speaking to others at that time. Accepting thIrtham that is seen by samsAris (worldly people) is an obstacle. One should understand that srIvaishNava srIpAdha thIrtham is superior to bhagavath thIrtham. Not having such understanding is an obstacle. Not knowing the real nature/glories of the thIrtham which was accepted simply based on the physical appearance of the giver is an obstacle. Based on what is recited while giving thIrtham, just accepting the thIrtham once is sufficient. Generally thIrtham is distributed during sARRumuRai (completion of pAsurams recital) and at that time it is sufficient to accept the thIrtham once. Not understanding this is an obstacle. AchArya srIpAdha thIrtham which is given out of the mercy of the AchArya should be accepted more than once. Not understanding this is an obstacle. Translator's note: In some mutts/thirumALigais, srIpAdha thIrtham is given twice and in other mutts/thirumALigais it is given thrice. Both have valid pramANam in sAsthram. So, it can be understood that srIpAdha thIrtham should not be accepted just once. One should understand that the srIpAdha thIrtham of the sadhAchAryan (true AchAryan) is worshippable always (just like gangA water kept in a pot is worshippable). One should also understand that it is sishtAchAram (practice followed by elders) and should be done by us also. Not having such understanding is an obstacle. srIpAdha thIrtham is glorified as vEdhakap pon (touchstone which can change copper into gold). Just by coming contact with srIpAdha thIrtham one will be purified. "sramaNi vidhura rishi pathnikaLaip pUtharAkkina puNdarikAkshan nedunOkku" (AchArya hrudhayam - the divine vision of srIman nArAyaNan who is glorified as puNdarikAksha/lotus-eyed purified sramaNi (sabari), vidhura and the wives of the rishis. Similar to bhagavAn's divine vision, AchArya's divine vision is also most purifiying. Such AchArya's srIpAdha thIrtham is to be considered very special. And this is called special knowledge. Not having such special knowledge is an obstacle. Translator's note: In the life of kUrathAzhwAn, a beautiful incident is identified. A srIvaishNava's son due to bad acquaintance become attached to avaishNava matters. But one day, he suddenly appears in front of his father with beautiful vaishNava attire with thirumaN (thilak), etc. At once, his father asks, were you seen by kUrathAzhwAn with his divine vision? Such was kUrathAzhwAn's glories that just by his vision, he would bring in most auspicious qualities in the person who was seen by him. Accepting srIpAdha thIrtham by just understanding the glories but without having great desire in accepting it is an obstacle. Not only just the glories should be understood, but there should be a great urge that was triggered by the desire to accept such srIpAdha thIrtham. Accepting certain thIrtham (like the ones which have dhEvathAnthara sambandham) is detrimental for the true nature of the jIvAthmA. Accepting such thIrtham boldly (without considering the consequences) is an obstacle. Accepting thIrtham happily when given first (before others) and accepting the same with hesitation when give after giving to others is an obstacle. thIrtham should be accepted at whatever situation without any anxiety with the understanding that it will purify the consumer. Refusing srIpAdha thIrtham as it contains the srIpAdha thIrtham of oneself as well. During special occassions, when srIvaishNava gOshti is conducted at homes, it is a common practice to gather the srIpAdha thIrtham of assembled srIvaishNavas. After doing so, the collected srIpAdha thIrtham is distributed to all. At that time, one should not refuse to accept that thIrtham since his own srIpAdha thIrtham is also mixed in it. One should accept such thIrtham considering the fact that it contains the thIrtham of the water that was used to wash the feet of many srIvaishNavas and that will purify us more. prapannas should not accept thIrtham which is used in certain karmAs to perform prAyaschiththam (atonement of sins). Doing so is an obstacle. When coming in physical contact with others such as saivas, etc., one should accept srIpAdha thIrtham to purify oneself. Not doing so is an obstacle. When physical contact happens, we should wash that portion which came in to contact and then accept srIpAdha thIrtham. This is the atonement for such contamination. We can recollect the incident in the life parAsara bhattar. When ashes from a pAshaNdi's body spread and touched parAsara bhattar, bhattar at once runs to his mother and asks how to purify that. His mother ANdAL who is very scholarly in sAsthram, instructs him to accept srIpAdha thIrtham of an abrAhmaNa srIvaishNava and bhattar requests one such person who carries emperumAn during puRappAdu and purifies himself. This incident is identified in vArthAmAlai 327th entry. Considering srIpAdha thIrtham to be pure only and not having great attachment (taste) towards srIpAdha thIrtham is an obstacle. It should be understood as most enjoyable as well. Being satisfied with accepting srIpAdha thIrtham just once and not longing for it every day is an obstacle. Just like a baby who is still drinking mother's milk will long for mother's milk greatly, one should long for AchArya's srIpAdha thIrtham. Not doing so is an obstacle. Missing out on AchArya srIpAdha thIrtham without understanding that this is the last birth for the AchArya in this material world is an obstacle. As said in thiruvAimozhi 9.10.5 "maraNamAnAl vaikuntham" (when he dies, he goes to paramapadham), we have to treat the AchAryan with great love and accept srIpAdha thIrtham and hear valuable instructions from him while he is alive. srIpAdha thIrtham should be accepted directly (from the one who distributes it) instead of accepting it through some one else. In case of perumAL thIrtham, at times, we see an assistant is being appointed for the thIrthakArar (the main adhyApakar of the temple). Such practice is not recommended. Fetching srIpAdha thIrtham oneself directly is an obstacle. One should accept srIpAdha thIrtham from the AchAryan or the person doing thiruvArAdhanam instead of oneself fetching it from the vessel. One should have great desire to accept srIpAdha thIrtham until they get it. Not having such desire is an obstacle. Translator's note: Here, casually/mechanically accepting srIpAdha thIrtham is condemned. Both giver and receiver of srIpAdha thIrtham must be fully focussed on dhvaya mahA manthram. Not being so is an obstacle. Translator's note: dhvaya mahA manthram and its meanings are to always contemplated along with guruparamparA manthram. This will constantly remind us that we are eternal servants of thAyAr and emperumAn, we accept emperumAn alone as upAyam and would increase our desire to eternally serve them in paramapadham. By reciting guruparamparA manthram, we are constantly reminded that our sambhandham to emperumAn is through this glorious lineage of AchAryas.